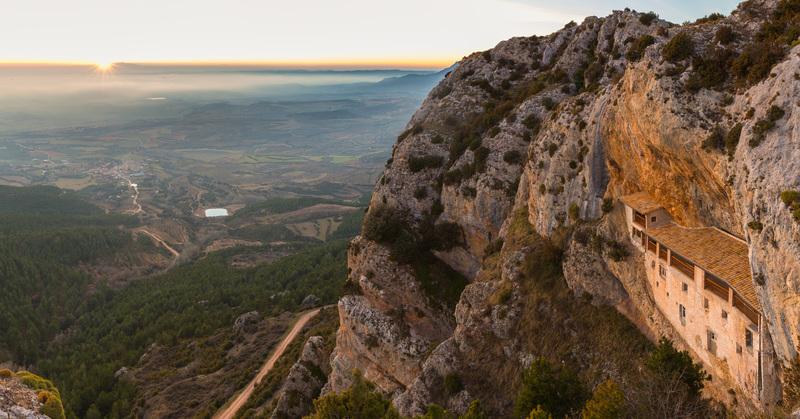 “Sunset view of the Ermita de la Virgen de la Peña (Hermitage of the Virgin of the Rock), province of Huesca, Spain. The village of Aniés is seen on the left. The oldest parts of the sanctuary date to Roman times, while much was built in the 13th Century. The hermitage is only accessible on foot, via a steep path in the forest and through caves in the mountain.”–The fact that this is known because folks had to make that long and treacherous trek is a beautiful thing to me. That they wanted to gives me hope. I can’t imagine how anyone ever even thought they could build such as that. So I quit trying that and now I can’t imagine how they did it. It all astounds me, and it draws me to it, the wondering and the pondering on they hows and why’s.